A girl locked in a cage and treated like animals for six years, after his father and mother did not like the girlfriend of their son. Zhang Qi, a girl from Jingang, Hubei province, China locked up since 2009. The case began when both parents Zhang Qi refused his girlfriend. They asked the girls to split. But Zhang Qi rejected. 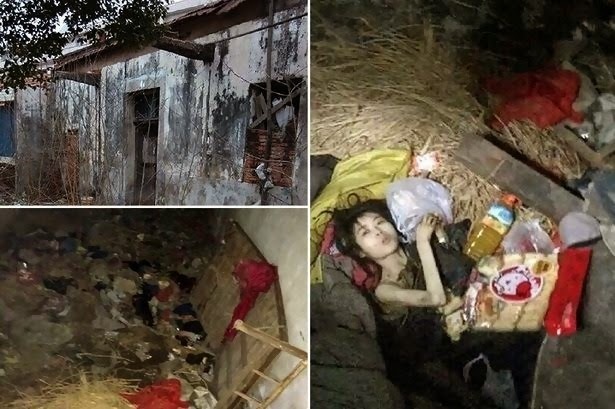 Since then, by reason of mental illness, both parents of the girl Zhang locked in a cage in the back of their house. Jen Chow, a neighbor who has long since moved to another city pleaded not bear any back Jingang Zhang Qi and see the conditions. "All the people here know about the confinement. But parents are people who have a strong influence in the region around here so that there are people who dare," said Jen Chow mirror.co.uk quoted as saying on Tuesday (25/2). "When I came last time, I saw him lying pinned straw with food scattered around. I felt enough was his suffering. I am sick to his parents," Chow said Jen who finally last condition immediately photographed the girl and pass it on. The 50-year-old man and handed the picture to the police, he also upload them to the virtual world. There has been no response from both parents Zhang Qi, but a number of photographs which he uploaded removed by the Chinese government.